The documentary, 'Family Portrait in Black and White,' examines the plight of mixed-race children in Ukraine. Three international documentaries recently premiered at the Sundance Film Festival in Park City, Utah. The films shed light on the struggle for empowerment by people around the world and offer a unique perspective on three different societies: Ghana, Ukraine and the United States. They are expected to be shown in movie theaters and on television around the world, later this year. The documentary, "An African Election," by filmmaker Jarreth Merz, examines the 2008 presidential elections in Ghana. For three months, Merz follows candidates of the two main political parties and documents their struggle for power. The stakes are high for the people of Ghana. Many suffer from extreme poverty and hope their candidate will change their lives. When the polls open, Ghanaians go, in large numbers. 'An African Election' shows democracy in action during the 2008 presidential elections in Ghana. "Ghanaians do not talk in general who they're gonna vote for. It's secret," says Jarreth Merz, the filmmaker who made "An African Election." "They call it the power of the thumb." The results are disputed. Allegations of stolen ballots and vote rigging excite passions and people threaten to take to the streets. The military stands by ready to quell an uprising. For a while no one knows what will happen. "There was live ammunition, people shooting around us," Merz recalls. But Ghanaians remain calm and order prevails. Merz says his documentary shows that democracy is as strong as its electorate and can take hold if it is nourished. In "The Black Power Mixtape 1967 -1975," Swedish filmmaker Goran Olsson presents the black power movement in America from a Swedish perspective. He uses archive footage of iconic African-American activists of the period, shot by Swedish reporters. Speaking in Stockholm, Stokely Carmichael, a black power activist, criticizes Dr. Martin Luther King Jr. for advocating non violence and integration. "He only made one fallacious assumption. In order for nonviolence to work, your opponent must have a conscience. The United States has none." 'The Black Power Mixtape 1967 -1975' features interviews with iconic African-American figures in the black power movement, such as Angela Davis. 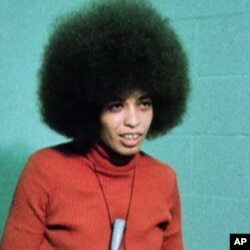 Accused of being an accomplice to murder, Angela Davis, then a black radical, talks to a Swedish reporter from prison about racism and raising a fist against social oppression. "You ask me whether I approve of violence? I mean that just doesn't make any sense at all," says Davis. "Whether I approve of guns. I grew up in Birmingham, Alabama. Some very good friends of mine were killed by bombs. Bombs that were planted by racists." According to Olsson, foreign reporters had unprecedented access to the activists. "When you're an outsider from a very remote place you could walk into certain communities or rooms and ask silly or naive questions and get really good answers," says Olsson, "because people understand that these Swedes they don't really understand everything. We have to be generous, explain." Olsson believes his film is still relevant. "I think what we've learned from the black power movement, and this resonates today for every ethnic group or minority or gender, is that you're entitled to rights and that you're not supposed to sit down and wait for someone to come along to give you your rights." "Family Portrait in Black and White," directed by Ukrainian filmmaker Julia Ivanova, is a dark film about racism in Ukraine. The story focuses on a Ukrainian family with 20 children. Many are mixed race. Olga Nenya - which means mother in Ukraine - is their foster parent. "What difference does it make - black white, yellow?" says Nenya. "They are just kids." But Olga cannot erase the stigma attached to the children's race, or their loneliness in their native country. "Their parents are Ukrainian girls and students mostly from Africa who come to study," says filmmaker Julia Ivanova. According to her, most young Ukrainian mothers abandon their newborns in the hospital because they can't bear the stigma of having a child of mixed race. "I've never heard of anyone adopting a black child," says a Ukrainian woman in the documentary. Despite the stigma, the children have dreams and aspirations. Some make it to college. "If I don't study hard, I won't get a good job," says Kiril, a mixed-race Ukrainian child. "Who needs you without a degree?" Ivanova says her film, aside from indicting racism, is a plea for people outside Ukraine to help these children. "At 18, they will leave the house of their foster mother and they will become biracial citizens of a country that doesn't look at them as equal," she says. Like the other documentaries, "Family Portrait in Black and White" is about an underdog who perseveres and survives.